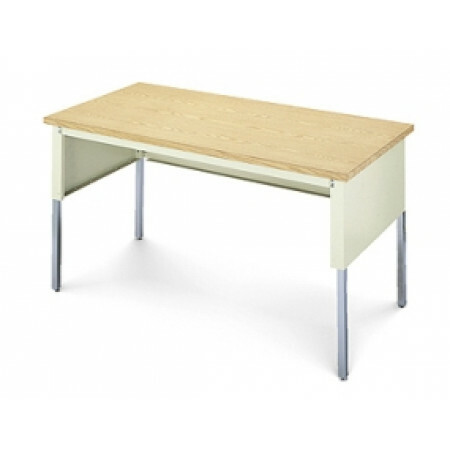 Adjustable height mailroom tables are the basic building blocks for the mail center, mailroom, warehouse and office. Finding the right strong adjustable height table is key; look for quality mail room tables that will hold up to the day to day operation of a busy mail center or office, our tables offer this - durable, well constructed adjustable height tables that are made to last, they feature good quality table tops and adjustable height legs which keeps bending and reaching to a minimum. Open under the table top for storage of carts, hampers and stacks of totes. • Front table support rail is 13 gauge steel and formed for maximum stength. • All steel construction table base is formed and welded for the strongest mail room table you will ever need.